Happy New Year! 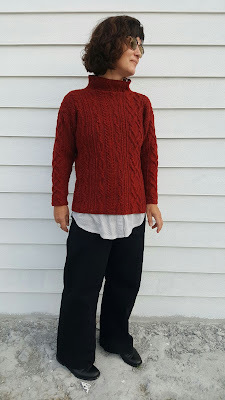 Here is my first sweater of this year. Or rather the last one from 2016. I finished it on December 31 and I call it Christmas sweater. 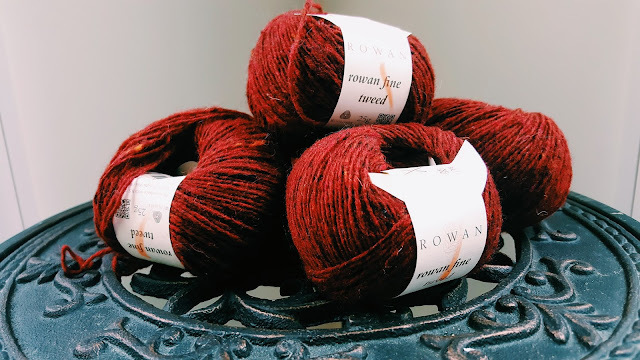 I bought this yarn - Rowan fine tweed - on a whim in a knitting store where I went to get new needles. Why? Two reasons – color and sale. I was immediately attracted to this color – it is a very deep shade of red, the one that is sometimes called “oxblood”. It is rich but not too bright and I just couldn’t stop myself and grabbed all the balls of this color from the bin. Plus the yarn was on sale – no brainer! The color turned out to be rather difficult to photograph. Camera wouldn’t give it justice – sometimes it was too red, sometimes – too dull. Here is probably the most accurate rendering. When I saw the pattern on Ravelry for the first time –boxy short jumper with a funnel neck - I knew that I had to make it no matter what. I love how youthful and playful it looks, especially the asymmetrical cables, that mix traditional and modern. The pattern is free and even though it is in Japanese (not my first language), the charts and schematics are clear and self-explanatory. No problems there. When I looked this pattern up online, there was a video of a model wearing this jumper and moving in it. It was obvious that I needed it to be a little longer and less oversized. Plus the sleeves were too large and bulky for my taste. And I couldn’t understand the slit at the front – there was no reason for it except an additional funkiness, but to me the jumper was funky enough without a slit. The overall design is pretty simple, almost nonexistent – just two identical rectangles ending up with a half funnel neck. The main attraction of this design is the intricate cables. I knew that making back and front the same was a bad idea, because in this case usually there are problems with fit. But I couldn’t think of an easy solution, the jumper is boxy and shapeless enough to compensate for the fit, plus I am rather flat chested and normally can get away with it. My children came home for Christmas, I was incredibly busy, and didn’t even think that I could manage to make something so complex-looking at this time of the year. So I ordered some green yarn for this sweater (yes, I wanted it green like on the photo and was planning on wearing it with red socks like on the photo as well – so cute!) and while waiting for the yarn decided to try the cables. Plus I wanted to see what kind of changes I needed to make in order to avoid excessive boxyness. 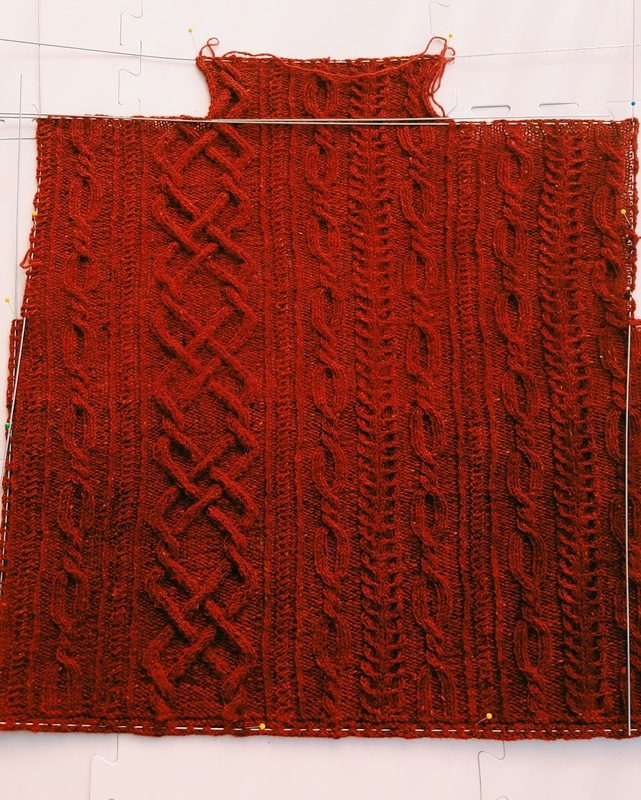 I took this amazing red yarn and started cabling… Almost immediately I understood why it was discontinued. Besides its color, softness, and tweediness I can hardly tell anything good about Rowan fine tweed. It is thick and thin, and I don’t mind its thickness, but the thin parts were really thin, at some points almost non-existent. The yarn was literally dissolving and disappearing in my hands. This yarn cannot be used for socks or mittens unless you are not planning on actually wearing them. They’ll have holes almost immediately, the moment you put them on. I don’t know how it could be used for clothes either because, you know, it will break… Actually, using it for a cabled jumper seemed to be the best solution: cables absorbed the thin parts and made them almost invisible (I am keeping quite a lot of leftover yarn to darn the future holes). There are only 90 meters (98 yards ) in a ball, yet, almost every ball had a knot or two in it. Which was annoying and quite irritating. So unlike other Rowan yarns. The last unpleasant surprise: the color bled when the sweater was washed. On Rowan website the yarn is described as “perfect for fairisle and color work”. I wouldn’t use it for either. Or be extremely careful and wash several swatches before committing to a project. Verdict: the yarn looks amazing but is not well made. Meanwhile I just couldn’t stop cabling. The cables on this jumper turned out to be easy and addictive, like popcorn. They were very logical and easy to memorize, not big and could be done without a cable needle, created a very interesting fabric, and overall were fun to knit. At some point I just gave up and decided to make the whole garment in this bloody red color with fine tweed. It seems like the jumper knit up all by itself because I don’t even remember how and when I was working on it. Christmas miracle, no less! Surprisingly enough, I like the end result. The sweater is lightweight, fits better than I expected, and goes extremely well with most of my clothes. We made pictures of it with a skirt and pants. I am sure I’ll be wearing it a lot while traveling this summer. Plus the funnel neck, according to Karen Templer, is going to be very trendy this spring! And who am I to argue with Karen Templer? I put all the specs on my Ravelry page (go there if you want to make something similar).